What Are Causes and Risk Factors of an ACL Tear? What Are Torn ACL Symptoms and Signs? When Should Someone Seek Medical Care for Knee Pain and/or Swelling? What Specialists Treat a Torn ACL? How Do Specialists Diagnose a Torn ACL? What Are Treatments for an ACL Tear? What Is the Recovery Time for a Torn ACL? Is It Possible to Prevent a Torn ACL? What Is the Prognosis for an ACL Tear? The anterior cruciate ligament (ACL) is one of four ligaments that help stabilize the knee. It is the most commonly injured knee ligament. 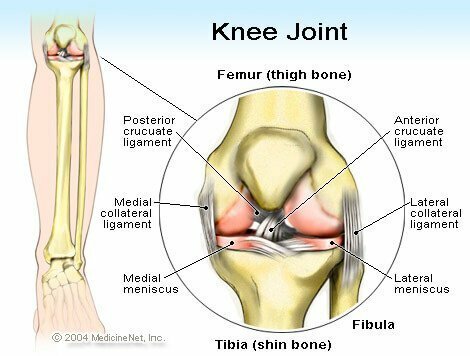 The knee is a hinge joint where the thighbone (femur) connects to the shinbone (tibia). The quadriceps muscles in the front of the thigh and the hamstrings in back help to stabilize the knee, but stabilization occurs primarily from the knee ligaments. There are four ligaments that keep the knee stable and moving in the proper direction. The medial and lateral collateral ligaments keep the knee from shifting side to side, while the anterior and posterior cruciate ligaments keep the knee from sliding front to back. The anterior cruciate ligament (ACL) is the most commonly injured knee ligament. The ACL attaches the lateral femoral condyle to the tibia just in front of the anterior tibial spine. Some of its fibers also blend into the medial meniscus. There are actually two bundles of fibers that make up the ACL and allow it to help stabilize the knee in flexion (bending), extension (straightening), and rotation. Injured ligaments are called sprains, and they can be classified based upon their severity. A grade 1 sprain occurs when ligament fibers are stretched but not torn. Grade 2 sprains have some fibers torn, but the ligament remains functionally intact. A grade 3 sprain occurs when the ligament is completely torn. In noncontact injuries, the person is usually changing direction quickly, making a sudden stop or landing from a jump. With the foot planted, the injured knee hyperextends (over straightens) and pivots at the same time, stressing the ACL and causing it to stretch and tear. In contact sports, the foot is usually planted and the blow causes knee hyperextension. High-risk sports include football, basketball, soccer, and skiing. The use of cleats also increases the risk of an ACL injury. Women are at higher risk of sustaining an ACL injury than men. Potential reasons for this increased risk may include differences in anatomy, training, and activity experience. Genetic differences in how muscles contract may also be another reason for the increased risk in females. Furthermore, women have a wider pelvis than men to accommodate childbearing, and this can cause an increased angle where the femur meets the tibia at the knee joint (Q angle). A wider angle increases the stress on the ACL, increasing the risk of injury. A narrow femoral notch may increase the risk of ACL injury especially in noncontact situations. The femoral notch is the space between the two femoral condyles that make contact with the tibial plateau in the knee joint. A narrow notch decreases the room where the ACL is located and can pinch the ligament during range of motion of the knee. This is especially true when the knee twists in hyperextension, potentially causing a tear in the ligament. Studies have also found that narrower notches are associated with smaller and potentially weaker anterior cruciate ligaments. Women tend to have less muscle mass than men but tend to perform the same tasks, especially on the field of play. The male's larger quadriceps and hamstring muscle bulk tend to protect and stabilize better a women's quads and hamstrings, if the same stress is placed on the knee joint. The patient usually can notice a loud popping sound as the ligament tears. Bystanders sometimes say that they can hear it as well. Pain is almost immediate. Knee swelling occurs within an hour or two as blood from the ruptured ligament fills the knee joint. Walking is difficult, and the knee feels unstable. Because of the fluid within the joint, it may be difficult to fully extend or straighten the knee. Pain and swelling in the knee is never normal, especially if it occurs immediately after an injury, and it is important to seek medical care to assess the joint damage. In addition to pain and swelling, warning signs of a potential ligament damage include giving way and limping. Initial treatments including RICE (rest, ice, compression, and elevation) are reasonable first steps but should not replace having the knee joint fully evaluated by a health-care professional. Orthopedic surgeons are often consulted to help diagnose knee injuries, and they are the specialists who are trained to operate and repair a torn ACL. Often, the initial knee injury is assessed by a primary-care provider or emergency physician. If the injury is sports-related, a certified athletic trainer or physical therapist may have examined the player on the field or court. A physical therapist will help care for the patient before and after surgery and will likely be involved in ongoing treatment even if no surgery occurs. The diagnosis of any knee injury begins with the history of how the injury occurred. Initially, the knee can be painful, swollen, and difficult to examine. The health-care professional may be able to detect the knee filled with fluid (effusion), but the pain and swelling may hinder the ability to assess whether any of the ligaments are damaged. If the swelling has decreased, the stability of the knee can be assessed by physical examination. There may be tenderness along the knee joint. The quadriceps muscle may be weak. There are maneuvers to test the stability of the ACL. These include the anterior drawer test, the Lachman's test, and the pivot shift test. Each is used to determine whether the connection between the femur and tibia is loose due to a torn ACL. The physical exam also may be helpful in assessing other structures within the knee that may also be damaged. These include stressing the collateral ligaments and assessing the menisci or cartilage. Plain X-rays may detect broken bones associated with an ACL tear. Magnetic resonance imaging (MRI) is done to evaluate the anatomy of the knee, and it can detect injuries to the ligaments, meniscus, and bone. While it is used to visualize the anatomy, it is not a replacement for the history and physical exam. Not all patients with knee injuries require an MRI. When surgery is considered, the ligament is not repaired but instead is reconstructed usually with minimally invasive surgery using an arthroscope. A variety of techniques may be used, and the orthopedic surgeon and patient usually discuss the options available before a decision as to what type of surgery is performed. The "new" ligament may be taken from part of the patellar tendon (the tendon that attached the quadriceps muscle to the tibia), from part of the hamstring tendon in the back of the knee, or it may be a donor or cadaver graft. Each option has its advantages and disadvantages. Other structures in the knee may also be damaged in association with an ACL tear, including other ligaments and menisci (cartilage), and will often be repaired at the same time. In children, instead of the ligament being torn, the ligament can pull a piece of bone off the tibial spine where it inserts. Surgery make be required to reattach the bony fragment instead of reconstructing the ligament. Surgery is often the recommended option for patients with ACL injuries. The purpose of surgery is to return patients to their original level of activity. For patients who are sedentary and do not perform sports, or for those who perform light manual work and are involved in non-cutting sports like running and bicycling, nonoperative treatments of ACL injuries may be reasonable alternatives. Level 1 includes jumping, pivoting, and hard cutting. Level 2 is heavy manual work or side-to-side sports. Level 3 encompasses light manual work and non-cutting sports (such as running and cycling). Level 4 is sedentary activity without sports. Treatment without surgery may be an option for those in categories 3 and 4. Surgery usually does not occur immediately after the injury but may be delayed three to four weeks or more. This time is used to allow for the initial swelling and bleeding from the injury to decrease and to plan for the operation. Physical therapists are an important part of the treatment team and are usually involved in the planning phase before surgery and after surgery. Recovery is measured in months, and often rehabilitation and physical therapy are required after the ACL reconstruction. This commitment to rehabilitation is an essential part of a successful operation. In the time prior to surgery, many patients are encouraged to "pre-hab" their injured leg. When the knee is injured, the quadriceps muscle tends to weaken almost immediately, and it is important to minimize any loss in strength and range of motion in the knee. In the first two to three weeks, the goal for physical therapy is to increase range of motion of the knee in a controlled fashion. Since the cruciate ligament graft needs time to heal in place, excessive flexing or bending is discouraged so that the graft doesn't rip. The goal in the first couple of weeks is full extension (straightening) of the knee and 90 degrees flexion (bending). In weeks three to six, the goal is to return full range of motion to the knee. Strengthening exercises may be considered and bicycles or stair-climbers are often used. For the next many months, the goal is to increase strength and agility while maintaining range of motion. The progress is closely monitored by the surgeon and physical therapist, again to protect the reconstructed knee and to push the patient to the goal of full recovery. The patient is often kept in a protective knee brace through much of the rehabilitation process to protect the grafted ACL from any undue stress. The brace use may be continued even after the ACL has healed, especially during sporting activities to decrease the risk of reinjury. The risk of ACL injuries may be decreased by performing training drills that work on balance, agility, and power. By teaching the muscles that surround the knee how to react when placed under stress, this muscle memory may help protect the knee joint when a potential injury situation exists. Neuromuscular conditioning occurs unconsciously as jumping and balancing exercises are performed on a routine basis. The Santa Monica Sports Medicine Foundation has developed a warm-up exercise program (Pep Program) designed to decrease the risk of knee injuries. It includes warm-ups, strengthening, plyometrics, agilities, and stretching. The success rate for surgical reconstruction of an ACL injury is between 75% and 95%. Operations fail because the graft fails to heal or reinjury occurs. If you tear your ACL, you may hear a pop. You will also notice your knee give way or become unstable and feel pain. This will, almost always, be followed by marked knee swelling over the next couple of hours because the ACL bleeds briskly when torn. Charlton, W.P.H., et al. "Differences in Femoral Notch Anatomy between Men and Women. A Magnetic Resonance Imaging Study." Am J Sports Med 30.3 May 2002: 329-333. "Management of Anterior Cruciate Ligament Injuries: Evidence-Based Practice Guideline." American Academy of Orthopaedic Surgeons. Sept. 5, 2014. <http://www.aaos.org/Research/guidelines/ACLGuidelineFINAL.pdf>. Simon, R., and S. Sherman. Emergency Orthopedics. China: McGraw-Hill Professional, 6th Edition, 2011. What was the treatment for your torn ACL? What is your recovery time? How was your torn ACL diagnosed? What were the symptoms of your torn ACL?